Over the past 12-18 months, it has become relatively easy to build an extremely powerful AMD desktop development workstation, with plenty of compute, memory and storage performance and capacity to support some pretty serious workloads. You can also build a system for a relatively affordable cost, compared to what you had to spend in years past. This is especially true compared to previous and current generation Intel HEDT systems. If you want the most total capacity and performance possible from an AMD desktop development workstation, you will want to build a machine based on one of the AMD Ryzen Threadripper high-end desktop (HEDT) processors. The 12nm, 2nd generation AMD Ryzen Threadripper processors have up to 32 physical cores (and 64 threads, with SMT enabled), and support up to 128GB of DDR4 RAM (eight x 16GB DIMMs), along with 60 PCIe 3.0 lanes for I/O or graphics. When 32GB desktop DIMMs become available in 2019, this processor will support those. A top of the line AMD Ryzen Threadripper 2990WX has 32 physical cores, which sounds impressive, but most people are going to get better performance for typical workloads by using the more affordable AMD Ryzen Threadripper 2950X, which has 16 physical cores. The 2950X has higher base and boost clock speeds than the 2990WX, and a different core to memory arrangement that yields better performance in many benchmarks. These second generation Threadripper processors were introduced in August of 2018, and they are drop-in compatible (with a BIOS update) with existing AMD X399-based motherboards. 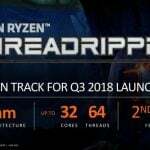 AMD has also stated that the next generation Threadripper processors, which will probably be 7nm, will also be compatible with existing X399 motherboards, which makes this platform more future-proof. Unless you want to just have your system sitting on a test bench or literally on top of your real physical desktop, you will need some sort of case to hold your components. Most AMD X399-based motherboards are using the ATX form factor, so you will need a case that is large enough to hold an ATX motherboard. You also need to think about whether you are concerned more about thermal performance or acoustic performance for your case. All 2nd generation Ryzen Threadripper processors will deliver much higher boost clock speeds when they are running at a lower temperature, so having good thermal performance from your case is actually pretty important for processor performance. Better thermal performance for a case is usually closely related to air flow through the case, but better air flow usually means more ambient noise from the case. Some people want their system to be as quiet as possible, but getting better acoustic performance usually means having less air flow, which hurts thermal performance. Gamer’s Nexus is one of the best sites for thorough, accurate case reviews. They have a very relevant post on thermal vs. acoustic performance here. A couple of top-rated, affordable cases for thermal performance are the Cooler Master H500P Mesh and the NZXT H700. Two top-rated, affordable cases for acoustic performance are the be quiet! Silent Base 601 and the Fractal Design Define R6. Your motherboard is the heart of a system, controlling how many PCIe expansion slots, M.2 and SATA connectors, and what kind of on-board network support you have. AMD X399-based TR4 motherboards are relatively expensive, so be prepared for that. I prefer ASRock X399 motherboards because they have high quality components and very good storage and network features (such as three M.2 Ultra slots and an included 10Gbps Aquantia NIC on some models). The exact model I have is the ASRock Fatal1ty X399 Professional Gaming, which despite the name, is a great choice for a workstation. Anandtech has a review of this model here. Newegg has this model here, while Micro Center has it here. I think you will want either the AMD Ryzen Threadripper 2950X or the previous generation AMD Ryzen Threadripper 1950X (which both will work in the same AMD X399 motherboards). The newer 2950X probably has 10-20% better performance, depending on the benchmark, but will be a little more expensive than the discounted, older 1950X. The best prices I am aware of are at Micro Center (if you happen to live near one of their 25 physical store locations). Here is their listing for the AMD Ryzen Threadripper 2950X and the AMD Ryzen Threadripper 1950X. BTW, if you purchase a processor and eligible motherboard together at Micro Center, you will get an additional $30 bundle discount. AMD Ryzen Threadripper processors do NOT come with a bundled CPU cooler. Even if they did, you would probably want to get a better aftermarket CPU cooler. This is even more important for the Threadripper, because of its very large size and sensitivity to temperature (due to XFR2) when it comes to boost clock speeds. Many existing CPU coolers do not match up with the large size of the Threadripper heat spreader, so you are not getting 100% coverage of the heat spreader. This includes many existing AIO closed loop liquid-cooling systems. One affordable, highly-reviewed air cooler is the Noctua NH-U12S TR4-SP3. Another benefit of this specific model is that it is not so large that it blocks RAM or PCIe slots on most motherboards. AMD X399 Motherboards have eight DDR4 memory slots, which can each hold a 16GB DIMM. DDR4 memory prices are finally starting to come down after being quite high over the past couple of years, so you can currently get a kit with two 16GB sticks of DDR4 3000 for about $279.00. I like Corsair Memory, and I have had good results with these Corsair Dominator Platinum units in my AMD Ryzen Threadripper 1950X system. Another important consideration for memory performance is how many memory channels are being used by the system. If you only have two DIMMs, you are in dual-channel mode, while four or more DIMMs will give you quad-channel mode, which will give you much more memory bandwidth. 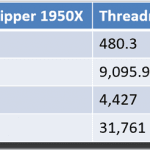 Higher speed memory, such as DDR4 2800 or higher, seems to be relatively important for AMD Ryzen Threadripper processors. AMD Ryzen Threadripper processors do not have integrated graphics, so you are going to need some sort of discrete PCIe video card. The exact card you want depends on your performance requirements and budget, and factors such as how many monitors you want to drive at what resolution. You also need to consider what kind of connectors you need for your existing, or perhaps new monitor(s). Display Port or mini-Display Port is the best kind of connection, followed by HDMI and the older DVI connectors. Assuming you aren’t going to use your system for heavy duty gaming or serious CAD work, you can probably get by with something like an NVidia GeForce GTX 1060 or better. Since the newer, more expensive NVidia RTX 20xx cards are available, the supply of GTX 10xx cards is going to eventually dry up. Luckily, the GPU-based crypto-mining craze has died down, so video card prices and availability are nearly back to normal levels. For an AMD-based card, you want an AMD Radeon RX 580 or better. Storage is a critical area for a high-end workstation machine. There are many storage technologies, interfaces, and protocols to choose from, and just getting “an SSD” without being aware of these choices would be a mistake for this type of machine. I would argue that you should try to go 100% with PCIe 3.0 x4 NVMe storage, whether it is using an AIC PCIe form factor or an M.2 PCIe form factor. Older SATA III AHCI SSDs are not a good choice for a system like this. The best choice for your system drive is an Intel Optane storage card, such as the Intel Optane SSD 905P or the slightly older Intel Optane 900P. These drives are admittedly expensive (ranging from about $2100 for a 1.5TB 905P to $270 for a 280GB 900P), but they all use Intel 3D XPoint technology (which is better and faster than NAND flash). All of these cards are PCIe 3.0 x4, and they use the NVMe protocol. There is no performance difference between the smaller capacity models and the larger capacity models, so your choice comes down to your budget and your space needs. If you want the absolute best performance for booting and patching, this is the way to go for your system drive. If that is not possible for budget reasons, then you should be looking at a high-end M.2 NVMe flash storage card, probably from Samsung. The two best current models are the Samsung 970 PRO and the more affordable Samsung 970 EVO. The largest capacity for the 970 PRO is 1TB, while the 970 EVO has a 2TB model. You probably won’t notice any performance difference between the 970 PRO and the 970 EVO. As always, larger capacity NAND flash SSDs from the same model line have noticeably better performance than smaller capacity drives. If you really want to go old-school, with SATA III AHCI SSDs, then the Samsung 860 PRO does have up to a 4TB capacity model, along with a more affordable Samsung 860 EVO that also has a 4TB model. Any SATA III AHCI NAND-flash SSD is going to be limited to about 550MB/sec of sequential throughput, and have much higher latency than a PCIe NVMe NAND flash drive. My preference would be a 280GB or 480GB Intel 900P for the boot drive, and then one or more M.2 Samsung 970 PRO or EVO drives for other purposes. External interfaces (for network connectivity and external storage) are also very important for a high-end workstation. Most X399 motherboards will have two 1Gbps Intel NICs, but some also have a 10Gbps Aquantia NIC. Even if your motherboard doesn’t have a 10Gbps NIC, you can add one later for less than $100.00. You will need a 10Gbps switch in order to have 10Gbps connectivity, but prices on those continue to decrease. You could start out with a Netgear GS110MX switch or a Netgear XS708E switch. You would also need something else, like a file-server or NAS that had 10Gbps connectivity, in order to benefit from this. Having USB 3.1 Gen2 (10Gbps) connectivity, whether it is a Type-A or a Type–C port is very useful for connecting to an external SSD (which could even be an M.2 NVMe drive). You could also have a Thunderbolt 3 AIC, for 40Gbps connectivity to a TB3 external drive or drive array. Having this many PCIe 3.0 lanes available (there are 64 total, with four reserved for the chipset on all AMD Ryzen Threadripper processors) gives you a lot of I/O flexibility. For example, a single video card might use either 8 or 16 PCIe lanes, while an Intel 900P storage card would use 4 PCIe lanes, and an M.2 PCIe NVMe storage card would use 4 lanes. Here is an example of how you could use some of these available PCIe 3.0 lanes in a Threadripper system. Depending on your component choices, you are probably looking at spending anywhere from $2500.00 on up for a system like this, so this is a serious investment for most people. You will have a very flexible, powerful, and relatively future proof system that is capable of doing some serious work. If you build a system like this, you will have a great AMD Desktop Development Workstation!